Saint Charles is a city in, and the county seat of, St. Charles County, Missouri, United States. The population was 65,794 at the 2010 census, making St. Charles the ninth-largest city in Missouri. Situated on the Missouri River, it is a northwestern suburb of St. Louis. 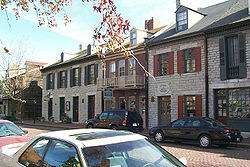 Founded circa 1769 as Les Petites Côtes, or "The Little Hills" in French, by Louis Blanchette, a French-Canadian fur trader,  when the area was nominally ruled by Spain following the Seven Years' War, St. Charles is the third-oldest city in Missouri. For a time, it played a significant role in the United States' westward expansion as a river port and starting point of the Boone's Lick Road to the Boonslick. Louis Blanchette was a French Canadian explorer in North America in the 18th century. After exploring parts of what is now Missouri, he is remembered for founding the city of St. Charles in 1769. The Boone's Lick Road, or Boonslick Trail was an early 1800s transportation route from eastern to central Missouri in the United States. Running east-west on the North side and roughly parallel to the Missouri River the trail began in the river port of St. Charles. The trail played a major role in the westward expansion of the United States and the development of Missouri's statehood. The trail's eventual terminus at Franklin was the start of the better-known Santa Fe Trail. First traced by the sons of Daniel Boone, the path originally ended at a salt lick in Howard County used by the pair to manufacture salt. Today the lick is maintained as Boone's Lick State Historic Site. 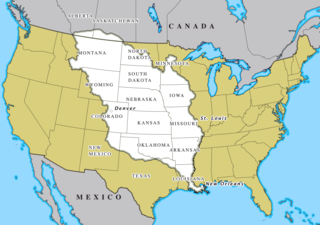 The Louisiana Purchase was the acquisition of the Louisiana territory by the United States from France in 1803. The U.S. paid fifty million francs ($11,250,000) and a cancellation of debts worth eighteen million francs ($3,750,000) for a total of sixty-eight million francs. The Louisiana territory included land from fifteen present U.S. states and two Canadian provinces. The territory contained land that forms Arkansas, Missouri, Iowa, Oklahoma, Kansas, and Nebraska; the portion of Minnesota west of the Mississippi River; a large portion of North Dakota; a large portion of South Dakota; the northeastern section of New Mexico; the northern portion of Texas; the area of Montana, Wyoming, and Colorado east of the Continental Divide; Louisiana west of the Mississippi River ; and small portions of land within the present Canadian provinces of Alberta and Saskatchewan. Its non-native population was around 60,000 inhabitants, of whom half were African slaves. The French and Indian Wars is a name used in the United States for a series of conflicts that occurred in North America between 1688 and 1763 and were related to the European dynastic wars. The title French and Indian War in the singular is used in the United States specifically for the warfare of 1754–63, the North American colonial counterpart to the Seven Years' War in Europe. The French and Indian Wars were preceded by the Beaver Wars. Lindenwood University is located on Kingshighway, near downtown St. Charles and St. Charles High. Founded by Major George Sibley and his wife Mary in 1827 as a women's school named Lindenwood School For Girls, the institution is the second-oldest higher-education institution west of the Mississippi River. The university is a private university affiliated with the Presbyterian Church. LU is one of the fastest-growing universities in the Midwest and enrolls close to 15,000 students. In 2006 it briefly attracted publicity when People for the Ethical Treatment of Animals staged a small protest against its unusual tuition fee policies. Lindenwood hosts 89.1 The Wood (KCLC), a commercial-free student-driven radio station. The Festival of the Little Hills is a historic St. Charles tradition that takes place every year in August, the third full weekend of the month. Started in 1971, this festival is known nationally as one of the top ten craft fairs. It runs through an entire weekend featuring great food, live entertainment, craft sales, and shows for kids. The festival is related to the famous Lewis & Clark expedition: many participants don clothing from the era and re-enact historic events. The city also encourages individuals to bring homemade crafts, jewelry, paintings, clothing and other items to sell at the festival. The Fete de Glace is an ice carving competition and demonstration held on North Main Street in mid-January. The Missouri River Irish Festival is held every September in Frontier Park and on Main Street to celebrate Irish Heritage with music, dancing, storytelling, athletics, food, and fun. During Quilts on Main Street, hundreds of quilts are displayed outside the shops on storefronts and balconies. This event is held annually in September. The Bluegrass Festival in Frontier Park on the big stage of Jaycee's pavilion is held early in September every year, featuring local and regional acts. As of the census  of 2010, there were 65,794 people, 26,715 households, and 16,128 families residing in the city. The population density was 2,782.0 inhabitants per square mile (1,074.1/km2). There were 28,590 housing units at an average density of 1,208.9 per square mile (466.8/km2). The racial makeup of the city was 87.5% White, 5.9% African American, 0.3% Native American, 2.5% Asian, 0.1% Pacific Islander, 1.8% from other races, and 1.9% from two or more races. Hispanic or Latino of any race were 4.2% of the population. As of the census  of 2000, there were 60,321 people, 24,210 households, and 15,324 families residing in the city. The population density was 2,962.4 people per square mile (1,143.9/km²). There were 25,283 housing units at an average density of 1,241.6 per square mile (479.5/km²). The racial makeup of the city was 93.28% White, 3.48% African American, 0.27% Native American, 1.01% Asian, 0.04% Pacific Islander, 0.73% from other races, and 1.19% from two or more races. Hispanic or Latino of any race were 1.97% of the population. A new residential development is New Town at St. Charles. 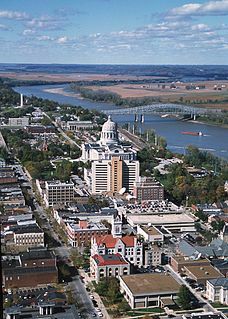 Jefferson City, officially the city of Jefferson, is the capital of the U.S. state of Missouri and the 15th most populous city in the state. It is also the county seat of Cole County and the principal city of the Jefferson City Metropolitan Statistical Area. Most of the city is in Cole County, with a small northern section extending into Callaway County. 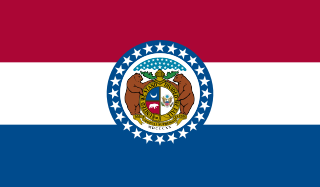 Warren County is a county located in the eastern portion of the U.S. state of Missouri. As of the 2010 census, the population was 32,513. The county is located on the north side of the Missouri River. Its county seat is Warrenton. The county was organized on January 5, 1833, and named for General Joseph Warren, who died in the Battle of Bunker Hill during the American Revolutionary War. Belleville is a city in St. Clair County, Illinois, coterminous with the now defunct Belleville Township. The population was 42,034 according to the Census Bureau's 2015 estimates. Buffalo is a city in Dallas County, Missouri, United States. The population was 3,084 at the 2010 census. It is the county seat of Dallas County. Louisiana is a city in Pike County, Missouri, United States. The population was 3,364 at the 2010 census. Louisiana is located in northeast Missouri, on the Mississippi River, south of Hannibal. Portage Des Sioux is a city in St. Charles County, Missouri, United States. The town sits on the Mississippi River roughly opposite Elsah, Illinois, and is the home of the riverside shrine of Our Lady of the Rivers. The population was 328 at the 2010 census. The city was founded in 1799 by Spanish Lt. Gov. Zenon Trudeau and François Saucier in reaction to American plans to build a military post about twelve miles (19 km) downstream. The French name derives from the overland escape route between the Missouri River and Mississippi River used by a band of Sioux, fleeing enemies; they used this area as a portage for their canoes, outdistancing their rivals who instead paddled all of the way to the confluence of the rivers. Weldon Spring is a city in St. Charles County, Missouri, United States. 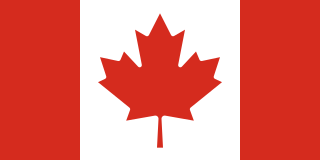 The population was 5,443 at the 2010 census. Florissant is a working to middle class second-ring suburb of St. Louis, located in far northern St. Louis County, in the U.S. state of Missouri. Based on 2017 U.S. Census Bureau estimates, the city had a total population of 51,443, making it the 13th-largest city in Missouri. East Prairie is a city in Mississippi County, Missouri, United States. The population was 3,176 at the 2010 census. St. Joseph is a city in and the county seat of Buchanan County, Missouri, United States. Small parts of St. Joseph extend into Andrew County, Missouri, United States. It is the principal city of the St. Joseph Metropolitan Statistical Area, which includes Buchanan, Andrew, and DeKalb counties in Missouri and Doniphan County, Kansas. As of the 2010 census, St. Joseph had a total population of 76,780, making it the eighth largest city in the state, and the third largest in Northwest Missouri. 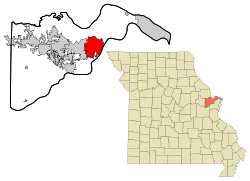 O'Fallon is a city along Interstate 64 and Interstate 70 between Lake St. Louis and St. Peters in St. Charles County, Missouri, United States. It is part of the St. Louis Metropolitan Statistical Area. As of the 2010 census O'Fallon had a population of 79,329, making it the largest municipality in St. Charles County and seventh largest in the state of Missouri. O'Fallon's namesake in St. Clair County, Illinois is also part of the St. Louis Metropolitan Statistical Area. The two O'Fallons are one of the few pairs of same-named municipalities to be part of the same MSA. 1 2 "US Gazetteer files 2010". United States Census Bureau. Archived from the original on 2012-01-24. Retrieved 2012-07-08. 1 2 "American FactFinder". United States Census Bureau. Archived from the original on 2011-06-20. Retrieved 2012-07-08. 1 2 "Population and Housing Unit Estimates". Archived from the original on May 29, 2017. Retrieved June 9, 2017. ↑ "Historic Saint Charles". Greatriverroad.com. Archived from the original on 2011-08-06. Retrieved 2011-08-02. ↑ "Timeline". Stcharlescitymo.gov. Archived from the original on 2011-07-21. Retrieved 2011-08-02. ↑ "St. Charles: Missouri's First Capitol". Slfp.com. Archived from the original on 2011-07-16. Retrieved 2011-08-02. ↑ Shrine of St. Philippine Duchesne Archived 2011-07-25 at the Wayback Machine , Academy of the Sacred Heart. Retrieved 2009-10-15. ↑ "City Council - St. Charles, MO - Official Website". www.stcharlescitymo.gov. Archived from the original on 16 December 2016. Retrieved 29 April 2018. ↑ "Abbeville Institute 2008 Lindenwood Summer School". Abbevilleinstitute.org. Archived from the original on 2010-04-14. Retrieved 2010-07-11. ↑ "Dennis Spellmann, 70, President who Remade Struggling College, Dies." New York Times 3 September 2006. Nytimes.com. 25 January 2007 (link) Archived 2008-04-22 at the Wayback Machine . ↑ "article mentioning St. Charles College". Libraryindex.com. Archived from the original on 2011-07-27. Retrieved 2011-08-02. ↑ "City of St. Charles Comprehensive Annual Financial Report". stcharlescitymo.gov. Archived from the original on 28 February 2017. Retrieved 29 April 2018. ↑ "Missouri River Otters of the UHL at". Hockeydb.com. Archived from the original on 2012-01-02. Retrieved 2011-08-02. ↑ "Owner shuts down IFL's River City". Billingsgazette.com. 2009-10-17. Archived from the original on 2011-08-04. Retrieved 2011-08-02. ↑ "Festival of the Little Hills - Fête des Petites Côtes, Historic St. Charles, Missouri". www.festivalofthelittlehills.com. Archived from the original on 29 September 2017. Retrieved 29 April 2018. ↑ "First interstate project". Fhwa.dot.gov. Archived from the original on 2011-06-07. Retrieved 2011-08-02. ↑ Peters, Megan (April 14, 2017). "Guardians Of The Galaxy Vol. 2 Clip Sheds Light On Film's Earthbound Scenes". ComicBook.com. Archived from the original on December 1, 2017. Retrieved November 18, 2017. ↑ "Mathew W. Pitsch". intelius.com. Archived from the original on April 8, 2015. Retrieved April 9, 2015.